The REPu Fan Engagement Platform is a complete suite of tools designed specifically for high schools and clubs. Our goal at REPu is to provide easy-to-use tools that eliminate the usual headaches and stress associated with managing content. The less time wasted on managing multiple platforms means more time available to provide real value back to your sports programs and school. We want to to change the way schools promote their sports and activities to increase engagement with their community. The REPu Fan Engagement Platform is the all-in-one solution for high schools and clubs that will bring your community together. The mobile app is the core of the REPu Fan Engagement Platform and enables schools and clubs to promote all their sports and activities, connect with their community and engage their fans. Give fans the professional mobile app experience they are used to. Every school and club gets a mirrored athletics website so all your content is exactly the same as it is in the app. With the REPu Fan Engagement Platform, all schedules, scores, rosters, news, photos and videos will look the same in both the mobile app and the website. 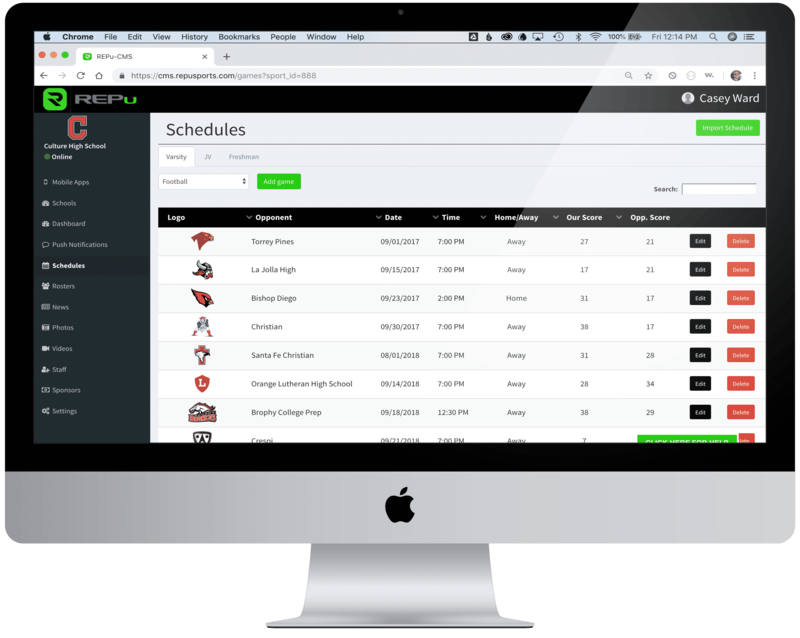 The moment you start to use the REPu Content Management System (CMS) you’ll quickly realize it was designed by coaches and athletic department staff. It’s incredibly easy to use and doesn’t require IT to get involved. The REPu CMS is used to manage all of your content and automatically updates your mobile app and website at the same time.